Just like the delightful Susan I took a break from the projects I was supposed to be doing to have a play with scraps for another basket. I did manage to finish Sheila's tiny (less than 4") bee blocks for Bee a Brit Stingy this week and got them sent off today. Her Princess and the Pea project is going to be so cute! I also got some work done on a playmat and should have this finished by the end of the week - just needs the binding bit done and some appliqué. 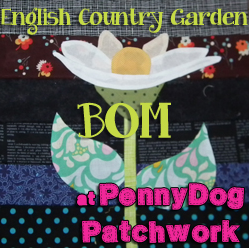 I have also decided to join in the English Country Garden block of the month over at PennyDog Patchwork. Kerry has designed 12 beautiful appliqué flower blocks on pieced backgrounds and is offering free downloads of each pattern on Craftsy (for one month only and then they'll be $1.50 each). She's covering different machine appliqué methods and you can needle turn if you want, you can get all the info here! She's starting with that lovely daisy - my favourite flower and the others sound exciting too! I've given up joining BOM's, I always fall behind and then give up. I hope you have more staying power than me! You are my hero. You added some to your list' but you are clearing items too. I like to think of my list as a loop, then I can be honest and know I'll never get to the end!!! I'm forever adding to my list, it's kind of embarrasing! I'm also joining the BOM though I don't have a good track record of keeping to them....I'm hoping that because it's applique I'll be more likely to keep with it as I can sew in the evening whilst also being socialable with the hubby!!!!! :) I really just wanted to end my comment with a smiley face, because c'mon, we're all notorious adders-to-the-list! But I just had to mention those gorgeous little scrappy squares! Gorgeous! Lucy, I agree! I used to struggle with this very thing, but once I let go of the worries of the numbers I found myself free to go with whatever creative thing hits me! Looking back one day I realized that in those super creative moments I actually completed more of those WIP's as I used them as leaders/enders between the projects I really wanted to do! :-D Enjoy the process, I always love what your brilliant mind comes up with!! You can never have to many projects on the go right...right?